Derek Dunn photographed by Nathan Sayers for Pointe. This is Pointe's October/November 2016 Cover Story. You can subscribe to the magazine here, or click here to purchase this issue. Houston Ballet's Derek Dunn knows how to make an entrance. While just an apprentice in 2013, Dunn catapulted through the Wortham Theater Center airspace as Garuda, god of dreams, in Stanton Welch's La Bayadère. But it wasn't just his powerful pyrotechnics that created buzz throughout the audience. He possessed unusual refinement for such a young dancer, combining seamless finesse with extreme crispness. That level of technical prowess and overall polish even brought to mind the Carlos Acosta era at Houston Ballet. 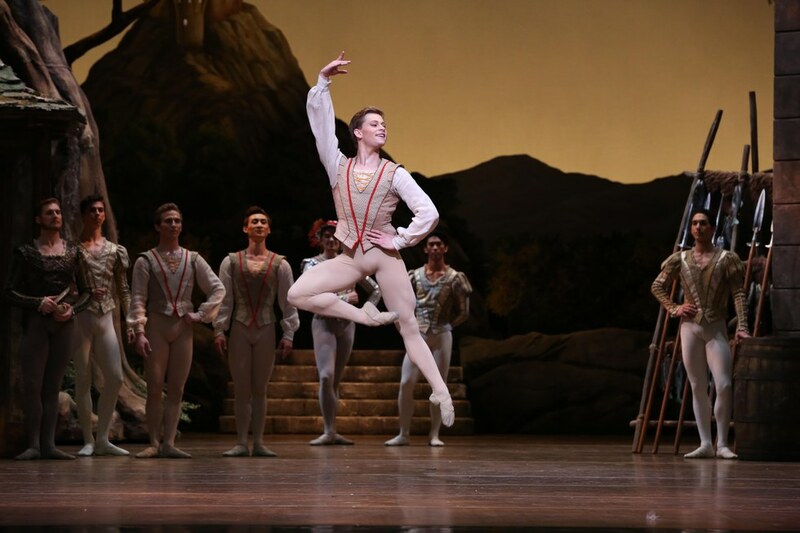 With his Texas-sized bravura, Dunn, 21, has created a powerful presence and impressive fan base at Houston Ballet in a few short years. Compact and boyish, he's demonstrated remarkable versatility in both classical and contemporary roles. Yet the former comp kid has also had to learn patience and humility, and overcome insecurities about his height. Now a newly promoted demi-soloist, his career is building exciting momentum, with no sign of slowing down. Dunn in "La Bayadère." Photo by Amitaa Sarkar, Courtesy Houston Ballet. Dancing came into Dunn's life the same way it does for many men, by watching an older sister. “I wanted to do everything Danielle was doing," says Dunn. Growing up in Glen Burnie, Maryland, he tried his first plié at Edna Lee Dance Studio, where he became a tap/jazz/competition kid. He also played every sport he could, but being a boy dancer was not without its complications—there were times when he was unfairly judged as weak. Dunn didn't let it get to him. “Dancing was never something I wanted to hide," he says. “I didn't feel the need to go out of my way to get everyone on my side." In addition to understanding friends, he had unrelenting support from his tight-knit family. “Even when I'm hard on myself and knock myself down, I know they're always there to lift me back up." At Edna Lee's, he met ballet teacher Ashley Canterna Hardy, who played a serious role in shaping his career. Noting his facility and work ethic, she suggested he focus more on ballet. “The cleanliness of his dancing is insane," says Canterna Hardy. “He's not just technical—he has the ability to tell a story." Dunn was willing to switch gears, and Canterna Hardy was struck by his determination. “He would not stop until a combination was polished," she says. He went on to attend the Kirov Academy of Ballet's summer intensive, where he experienced his first men's class and a glimpse of a life on the professional track. “I discovered how much I loved ballet," he says. Then, a surprising win at Youth America Grand Prix at age 12 opened Dunn's eyes. “I realized that I am good at this." Dunn in Act I of "Giselle." Photo by Amitava Sarkar, Courtesy Houston Ballet. At 14, he received a scholarship to The Rock School for Dance Education in Philadelphia, where he spent the next three years. The schedule was a huge adjustment. “My daily workload had doubled, if not tripled," recalls Dunn, who was also living on his own for the first time. There, teacher Natalya Zeiger and school directors Bo and Stephanie Spassoff helped him develop partnering skills, cleaned up his bad habits and “taught me to turn like a ballet dancer." He also continued to compete, winning the Senior Gold Medal at YAGP in 2012. It was there that Houston Ballet's artistic director, Stanton Welch, discovered him. “He kept delivering one great solo after another, and he's so unaffected," says Welch. “I was on the lookout for a shorter man, and Derek was the right fit." Dunn had planned to continue training at the John Cranko School in Germany when Welch offered him an apprenticeship. The decision, he says, was a no-brainer: “Why go to Europe when I had a job offer?" But the transition to professional life came with a few speed bumps. At 17, he was the youngest member of the company. While his competition experience had helped him nail a job, it didn't prepare him for the professional world's unspoken etiquette. “I wasn't used to the hierarchy," he explains. “I had to be told not to be in the front of the room." He also found the rate at which the dancers learned new material mind-boggling. “Everyone here picks up choreography so quickly," Dunn says. “I am getting better at it, but it takes me more time to get it in my body." He bonded with former Houston Ballet dancer Jim Nowakowski, another competition veteran, right away. (The pair's virtuosic, perfectly synchronized pirouette videos on YouTube are a fun homage to their comp kid backgrounds.) Yet Nowakowski, who left the company in 2015 to be a contestant on FOX's “So You Think You Can Dance," stresses that Dunn's authenticity is what makes his dancing so powerful. “Yes, he can do every trick in the book," he says, “but that's always the cherry on top." In spite of his rocky beginning, Dunn's apprentice year was not without opportunity. In addition to his standout role in La Bayadère, he danced in Welch's impossibly fast Clear (he later danced the lead, originally created for Angel Corella). The performance was his baptism into the Welch canon, a rite of passage for any Houston Ballet dancer. Over the next few seasons, Dunn continued to build momentum. Welch created an eight-minute solo on him in Sons de L'âme, performed in Paris at the Théâtre des Champs-Élysées with piano virtuoso Lang Lang. “I felt there was nothing he could not do," says Welch. Indeed, Dunn has showed exceptional range, easily transitioning between classical ballets and the more contemporary works by William Forsythe, Mark Morris and Trey McIntyre. Dunn and Melody Mennite in Wayne McGregor's "Dyad 1929." Photo by Amitava Sarkar, Courtesy Houston Ballet. Dunn also proved himself as Balthasar, one of Romeo's rascally sidekicks in Welch's Romeo and Juliet. “I had to play around with the character's fighter side, because it didn't come naturally to me," says Dunn. “But that's the fun part of playing different roles. They force you out of your comfort zone and pull out a different side of yourself that you didn't know you had." In the spring of 2015, however, his momentum came to screeching halt. First, he sustained an end-of-season ankle injury. Then, the following fall, he injured his other foot, leaving him offstage for a total of six months. “Mentally, I had to struggle every day that ballet was taken away from me," he says. “I was forced to develop a life outside of ballet. I was a normal kid once. I did some socializing with non-dancers, and I remain connected to these friends." Last February, he came flying back in top form as the Bluebird in Ben Stevenson's The Sleeping Beauty. His Princess Florine, soloist Allison Miller, was happy to see him back. “Derek is confident and connected to whatever role he's performing and to whomever he's dancing with," she says. Dunn received his long-anticipated promotion to demi-soloist last spring. While he has yet to dance a lead role in a story ballet, he feels the potential is there. (Someday, he hopes to dance Romeo.) And while he's 5' 7", he doesn't see his height as a barrier to princely roles, citing Daniil Simkin, Herman Cornejo and Mikhail Baryshnikov as his inspirations. “Growing up, I always saw my height as a negative," says Dunn. “I thought if I were taller, I would get more job offers and do more roles. I've learned that, in the professional world, I can also see my height as an asset. Being a shorter dancer has given me opportunities to stand out in solo roles—it makes me different." His confidence is contagious rather than cocky. “I am on the right track. I'm going to roll with that," he says with a boyish grin. “I want to do it all."